Back to the future for Arriva? This bus was seen in Valletta yesterday carrying a sign saying “Arriva”. Commuters passing through Ġlormu Cassar Avenue in Valletta may have been forgiven a touch more confusion yesterday as Arriva struggles to reduce the number of complaints about its service launched 10 days ago with brand new China-made buses. 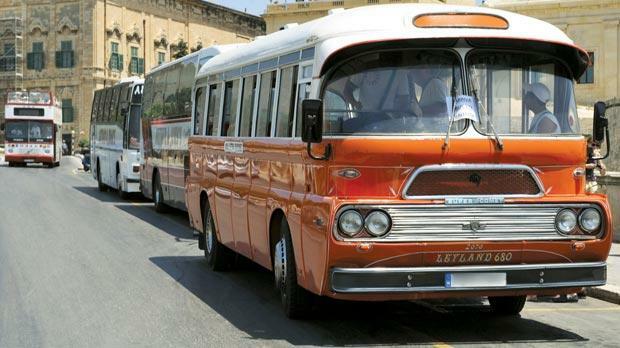 A Maltese bus, which looked like a 1960s model, was spotted parked on the road with a sign on it that read: “Arriva Bus 122 Valletta”. A fresh coat of zesty orange paint has been applied to the classical vehicle. The bus brought an equally confused reaction from a spokeman for the public transport company. He said he had been informed the bus was not being used on Arriva Malta routes but has been offering tourist excursions. Arriva’s route 122 buses take passengers from the Marsa park-and-ride to Valletta and back. The spokesperson said Arriva had temporarily sub-contracted a small number of feeder routes for an initial period of three weeks. “The routes are being operated on our behalf by the unscheduled bus co-op using minibus vehicles,” he said. Arriva, he added, was not using any vehicles similar to the one spotted at Valletta. Meanwhile, boat owners in Senglea also took advantage of the problems faced by Arriva and re-launched a semi-regular harbour service using traditional water taxis known as dgħajjes tal-pass after people complained about the lengthy journey to Valletta on the new aquamarine buses. Boat owners were hit badly by the introduction of buses a century ago but the promise of a six-minute boat trip to Valletta has lured customers back. The traditional boats pick up passengers from Senglea Wharf and drop them off Customs House or the Siege Bell Memorial in Valletta.